A girl vanishes on her way to school, and the Detective Boys decide to investigate. Conan fears the arrival of a new Black Organization member. Conan figured out from accounts of the missing girl's trip to a convenience store that she was secretly feeding some kittens at some unoccupied building. But when they found the kittens, the girl was nowhere to be seen, and there were clues to a recent motor accident nearby. Traffic police Yumi came and rendered help to the kids. A client asked Mori Kogoro to locate his girlfriend who drove off in his car after a quarrel. The client said he needed a file left in the urgently. When they tracked the car down to the place where the client and his girlfriend first met, they found her dead inside the car. After locating the girlfriend’s car in the mountains with her dead inside, the police suspect it is a suicide following the quarrel. Conan believes the boyfriend is guilty but needs proof. Mori, Ran, and Conan are at a cafe when they run into Takagi who is aiming to pick up girls. Meanwhile, he finds Sato there doing the same. After a tense date with two strangers, Conan realizes from the conversation that a boy home alone is in danger. When they arrive at their house, the boy has been kidnapped. The kidnapper leaves an email demanding money. After solving clues Takagi leaves suddenly and Conan reveals who the kidnapper is. Just then, the boy returns home unharmed, making them believe the culprit will try to make a run for it. After arriving to his house it is revealed that a winning lottery ticket was returned to the culprit in his mailbox, making him release his friends had no intention of stealing from him and the guilt of his crime caused him to suicide. Takagi manages to save his life while Sato yells at him for the danger he could have been in. Kogoro and Conan visit a famous author named Osamu Umezu in order to have his book signed. Later they spot Osamu's secretary, Mikami Touru, running to Osamu's house. They learn that Mikami that Osamu is not answering his phone calls and he was going to check up on him. They accompany him to Osamu's apartment and find Osamu dead. Evidence suggests it was suicide but Kogoro notices blood on the trash bin and reveals that it was a murder. Osamu's assistant and son are suspects to the murder due to being the only ones with keys to the apartment. Conan investigates and after putting Kogoro to sleep, impersonates him and reveals the murderer to be Mikami. He reveals that Mikami tied a string on the roof where it hung in front of Osamu's window. After poisoning Osamu, Mikami left the apartment and locked the door. He afterward went to the roof and using the string he set up, sends the key back to Osamu's apartment. Conan reveals that Osamu's died holding his trophy he won with his book. Conan explains the trophy was held upside down to reveal Osamu's book titles were and Mikami's name was also palindromes. As evidence, Conan reveals that Osamu managed to rip a button from Mikami's shirt and using the gum he had, stuck it onto the sofa. Mikami confesses to his crime and reveals that Osamu stole his manuscript and published the book as his own. Kogoro is asked to investigate a dog that is being aggressive towards someone. Yet, Conan and Ran suspect she did something to cause the dog’s aggression. While investigating a murder, suspicions fall on Conan for being too smart so Conan plays dumb for the rest of the day, much to the Detective Boys dismay. Conan continues to investigate while playing dumb, but how does he give a deduction while being kept such a close eye on? Ran and Sonoko are tidying Shinichi’s house when a client comes looking for him. They take the case in his place to find the girls grandmother. The waitress of Poirot Cafe, Azusa Enomoto, reported she received strange messages from a boy, suggesting he might be kidnapped or trapped in a location without food and water. The only way to find him is by reading his text messages. The boy only knows how to send, but does not know how to receive. Conan must put the clues he gives to find out his location. Two clients fearful for their lives approach Kogoro. The same person is threatening both of them! While on the set filming the latest Kamen Yaiba movie, an overeager stunt driver is found dead in a car crash. 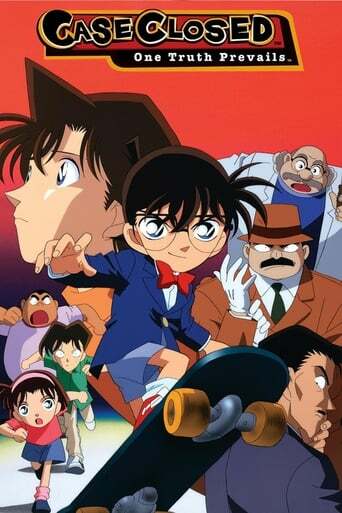 Kogoro and Conan are brought to an apartment to examine the death of a man named Yamamoto. It is presumed a suicide as evidence project he put a gun in his mouth and firing. His friend is suspected of murdering him as he left the crime scene without calling the police. When Kogoro is fed strawberries, Conan realizes who the murderer is. After investigating Yamamoto's dentist, Conan tranquilizes Kogoro and reveals the murderer to be Yamamoto's neighbor, Yumi Suzuki. Conan reveals that Yumi Yamamoto's dentist assistant and deduces Yumi entered Yamamoto's apartment and offered to treat him. When he opened his mouth, Yumi shot him with a gun. As evidence, Conan reveals that Yamamoto's coffee stirrer is actually Yumi's dental mirror. A man is crushed under steel beams, but when investigating his bag there is a suicide note. Was this an accident, attempted murder, or an actual suicide? The Junior Detective Club were at the beach digging up clams. They encountered a college group of students on a similar excursion. Later, one of the college boys was found dead from poisoning. Was it suicide, or murder? Inspector Jugo Yokomizo was called to the scene to investigate. Mori Kogoro solves the case! It is a busy day for the detective when he plans to meet a client and watch the new Okino Yoko drama series. His assignment is to decipher a suspicious text message written in code by the client's daughter. However, Mori finds out there is a cat in the office. It is Goro, a Russian Blue that belongs to Eri. While Eri has to Okinawa for a case and Ran and Conan go to school, Mori has to look after the cat. Mori becomes annoyed with Goro when gets cathair over the wash towel, knocks down an English-to-Japanese dictionary, plays with shoes, and goes into the video collection. But through these hints, Mori is able to figure out the coded message! It turns out Conan hid katsuobushi in several places so Goro could give hints to Mouri. In the end, Eri shows up to pick up Goro. While hiking, Ran, Sonoko, Eisuke, and Conan discover an abandoned and collapsed lodge building. They are out of cell phone range and find a nearby villa, but while they await their ride, Eisuke spots something. Inspector Misao Yamamura arrived to investigate. Conan also tries to gather clues to help but is limited to what he can do when a sneaky Eisuke starts to spy and watch him. Conan has to use different tactics so he won't seem suspicious of him. Moore, Conan, and Inspector Megure are walking towards a Rakugo ( a type of Japanese play center) where Moore will attempt to act and win the prize of "All you can drink". They make a stop at a famous Rakugo actor's restaurant named Meguro. Ichimatsu is the owner of this shop and he works alongside his ex-wife Meguro Miya. After the play, Ichimatsu is stabbed and sent to the hospital. The evidence points the culprit to be Meguro Miya, but then Ichimatsu's assistant named Manragutei Kisaburau appears claiming he stabbed Ichimatsu. While both of them try to convict themselves, Conan figures out who the culprit is. Once solved the Miya and Kisaburau go out on a date. In the end, Moore practices his horrible play forcing Conan, Inspector, and one of the cops to listen. Takagi and Miyamoto pose as a bride and groom in order to catch a serial killer/burglar who had threatened to kill the real bride and groom. When Chiba reports that the burned corpse of one of the wedding guests is found near the river, Megure deduces that the victim was killed by the serial killer in order to obtain the wedding invitation. A mysterious video arrives at the wedding party from a friend of the groom. After watching the video, Megure suspects that the killer is already in the chapel and Conan suggests that the bride meets with the guests in order to find the burglar who broke into her house. The bride reports that there are three suspicious guests: a photographer, a snowboarding instructor, and an internet administrator. The groom insists that the wedding to proceed, despite Megure's protests. As the bride walks down the aisle, the burglar suddenly appears. However, the groom announces that the burglar was actually a police officer, Chiba, posing as the burglar. Megure points out that Chiba has been by the river and the groom could not have figured out the burglar's true identity. Megure also reveals that the groom was the burglar's accomplice and in the end killed the burglar so he could marry the bride for money. When the groom attempts to escape, he is stopped by Conan and Ran. A famous magician hires Kogoro to keep watch on his staff members, as he believes one of them may be out to kill him. For his first act, he lies on a bed of spikes and is slammed with another, which has Conan and Kogoro worried until he's revealed to be alive. The next trick does not go so well, and he ends up trapped in a water tank where the entrance has been sealed. By the time it's open and he's rescued, it's too late, and one of his workers is responsible. Conan fishes around for clues in hopes of finding the true culprit. After gaining info, he learns who's behind the trick, and exposes the true mastermind behind the death of the magician. Conan, Ran, Mouri, and Sonoko travel to Shikoku to see the kabuki play Phantom of the Konpira. It is a play based on Phantom of the Opera. Things start to mimic the play. There are requests for a heroine change, sightings of a phantom, and a deliberate attempt on the heroine, just like Phantom of the Opera. The chief of the stage setting is killed, and the chairman and the sponsor are arrested by circumstantial evidence. Conan uses Sonoko to reveal that heroine tried to ruin the theater's play. A man buys a ticket to see a movie, which is a sequel to another he and his friends have seen in the past. He gives his ticket to one of his friends, then leaves, but clues he has left behind leads Conan to believe that he has more on his mind. He plans to commit suicide and plans frame his friend for it afterward. Will Conan be able to prevent his plan before he follows through with it? A writer and his ghostwriter get into an argument resulting in violence. The Detective Boys are playing baseball nearby when Genta hits a home run through the window. When they go to retrieve the ball, they stumble onto a body. The author tries to complete his alibi, but the Detective Boys finding the body so soon complicates things. Can they solve it in time? A murder occurs in an apartment. The victim is a famous detective author. After finding the evidence through the sushi, the culprit was revealed to do it out of love for the author's mystery. Sonoko brought Ran, who brought Conan, to visit the site in the country used as a location in the filming of a well-received romantic TV serial, where the lead actress tied a red handkerchief to a tree branch to enable her lover to find her. The success of the serial went beyond expectation and the sleep rural area became a popular spot where female visitors tied red handkerchieves all over the woods, spoiling Sonoko's scheme to lure Makoto for a romantic rendezvous. They encountered a man who claimed to be part of the TV serial crew and commissioned by a fan to find the exact location of a tree with the original red handkerchief in the show. Shortly afterward, he was discovered, stabbed dead, at the spot. The murder investigation narrowed to three suspects who were recent arrivals at the nearby inn. Conan deduced the culprit and the cause of the murder. He confronted the culprit at the murder site, but a shock waited for him, Ran and Sonoko - the culprit was not alone! The culprit was a yakuza lieutenant who brought henchmen far too numerous for Ran to deal with alone. Makoto arrived in the nick of time, he and Ran fought them off until the police arrived. An overly strict man is accused of murdering a woman. Is it murder or is it self-defense? Conan must investigate and figure out the truth. The teacher of the Detective Boys decides to give the class a mental test. Conan is called by the teacher so the class must solve it without him. They solve it with the help of two silent out-casted students. It turns out it was a plan to include the new students so they feel more involved. While studying in the library Ayumi finds a book with a missing page in it. The Detective Boys investigate who last checked out the book. In the hospital, the FBI talk about Rena Mizunashi. Elsewhere, a child witnesses the murder of a rock roll star, and Conan and the group try to figure out what he saw. Conan gets suspicious of Eisuke who starts showing similarities to Kir. Conan and the others attempt to solve the case of the murdered rock star. Near the end of the case, Eisuke tries to find info on how Kogoro solves it, only to be interrupted by Conan claiming to be tired. Eisuke swiftly glares at him, giving further speculation that he may be working with the organization, and his secret identity may no longer be safe. Eisuke manages to find another case and convinces Kogoro into taking it. A woman is murdered, and her son says he saw who did it. Conan realizes that the case has something to do with the organization, as the boy was a witness to Kir's abduction by the FBI in episode 425. Conan solves the case but makes an astounding revelation afterward. It appears the foreign woman the boy encountered happens to be no other than Vermouth.